Wide receiver DeSean Jackson is on the move again, going in a trade from Tampa Bay back to where he started, the Philadelphia Eagles, according to NFL insider Adam Caplan. From a fantasy football perspective, this is largely interesting from a nostalgia perspective, but there is some best ball upside in the move as well. 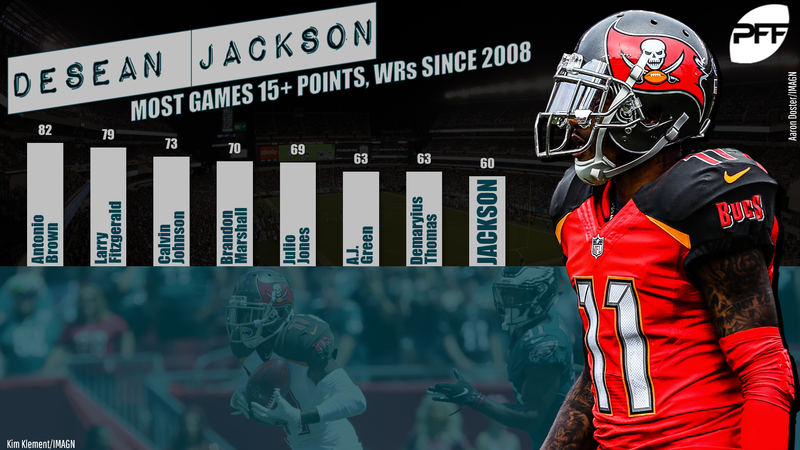 Jackson was a bona fide fantasy star early in his career, topping 900 receiving yards seven times in his first nine seasons split between Philadelphia and Washington, and putting up at least 4.3 yards after the catch per reception every year. Times weren’t as good in Tampa Bay, however, as Jackson totaled barely over 1,400 yards across two seasons with the Buccaneers and topped out at a lower YAC average than he ever put up before. Even at that, Jackson’s 2018 numbers are elevated by his 275 yards and 3 touchdowns in Weeks 1 and 2; the rest of the year, in 10 games, he totaled 499 yards, 1 touchdown, and only 1.7 yards after the catch per reception. That’s always been Jackson’s game, though. He has been enough of a boom-or-bust player in his career that he’s become his own fantasy football archetype — he once went three full seasons (2014-2016) without a single game between 6 and 10 standard fantasy points. That trend tapered off a bit in Tampa Bay, but his upside still remains high. Back in Philadelphia, Jackson is at best the No. 3 man in the target pool, behind Zach Ertz and Alshon Jeffery, but he fills the outside-receiver role the team has lacked after Torrey Smith and Mike Wallace failed to fit the bill in recent seasons. With a strong passing offense that also includes Dallas Goedert and if-he-sticks-around Nelson Agholor, the Eagles won’t need Jackson to be a target hog, but he can still put up the occasional big game. That makes him mostly an afterthought in redraft leagues, but for best ball purposes, Jackson is worth a late flyer. In Tampa Bay, Jackson’s departure opens the door for Chris Godwin and probably O.J. Howard to develop. There are only so many targets a player can soak up, so Mike Evans is at or near his ceiling. Godwin and Howard, though, still have room for growth. Godwin had plenty of big games when Jackson missed time during his Tampa Bay tenure, and with new head coach Bruce Arians typically liking a throw-it-deep offense, Godwin could be a similar type of fantasy option to the Jackson of yore. He’ll carry far more fantasy value than he would have with Jackson, obviously, and this makes him a WR3 with upside in redraft leagues, slightly higher in best ball.